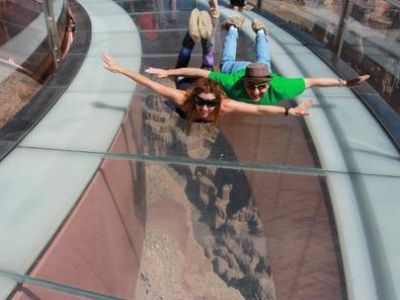 Grand Canyon Skywalk tours from Las Vegas are an experience you will never forget. This is a wonderful piece of modern day engineering. The four-inch thick glass bridge is suspended 4,000 feet above the canyon floor. The 70-foot horseshoe shaped structure offers 360-degree views of the natural surrounding beauty. Below are some of the best tours and day trips from Las Vegas to Grand Canyon West that include the Skywalk. This is a Grand Canyon tour of your lifetime. Adventure to the greatest natural wonder in North America and step out over the edge as you view this natural masterpiece. You will experience the Grand Canyon through the air and even float down the Colorado River on the Grand Celebration tour. This exciting Grand Canyon Skywalk tour begins with a shuttle pickup at your hotel and a trip to Boulder City’s airport After boarding the airplane you will fly over such places as Hoover Dam, the Black Mountains, Lake Mead and even the Grand Wash Cliffs before landing on the West Rim of the Grand Canyon. Upon arrival at the Grand Canyon your helicopter will gently descend some 4,000 feet to the canyon floor and float down the majestic Colorado River on a pontoon boat for one mile. Your tour guides will offer expertise on the canyon and the surrounding cultures during your adventure. After your float trip, you will be transported by helicopter back to the West Rim. Once there, you will be taken to the Hualapai Reservation to experience the extreme Grand Canyon Skywalk in VIP style. After a quick snack and energy boost, go straight to the front of the line and gaze down into the Grand Canyon as you walk along the 70-foot U-shaped glass walkway. Unfortunately cameras are not allowed on the Grand Canyon Skywalk but you do receive a souvenir photograph. Your Grand Canyon Skywalk tour ends with a helicopter ride into Boulder City and a quick shuttle ride to your hotel. One note of importance: Each guest that weighs over 300 pounds will be required to purchase an additional adjacent seat, at a reduced rate, for helicopter for safety reasons. Incredible views you will never forget when you take this helicopter and Skywalk tour of the Grand Canyon. Your helicopter flight, 45-minutes each way, will offer excellent views of Hoover Dam, an engineering marvel, as well as, Lake Mead the largest man-made lake in the Western Hemisphere. Once you arrive at the West Rim of the Grand Canyon you will be transported to take the Grand Canyon Skywalk tour located on the Hualapai Reservation. There are restrictions at the Skywalk such as no cameras or phones but your tour includes a souvenir photo of your group at Skywalk. On your flight home from the West Rim, you will buzz above the famous Las Vegas Strip for a spectacular view of Sin City to end your 4-hour tour. Take a direct helicopter from the Las Vegas Strip and experience the engineering and natural marvel of the Grand Canyon Skywalk. You will fly for 45-minutes over Las Vegas with spectacular views of Hoover Dam, Lake Mead and the Grand Canyon. Your pilot will offer you interesting information that will enhance your experience. When you land at the West Rim of the Grand Canyon, you will be taken to the Grand Canyon Skywalk located on the Hualapai Reservation. Once at Skywalk you will be given front of the line access to walk across one of the most intriguing pieces of engineering in the world. Your 4-hour Grand Canyon Skywalk tour concludes with another exhilarating 45-minute helicopter flight. Please note that this is a tour for those that wish only to fly to the Grand Canyon and experience the Skywalk. Additionally, patrons over 300 pounds in weight will be required to purchase an additional adjacent seat, at a reduced cost, for helicopter safety reasons. 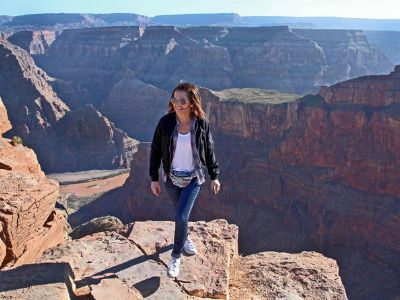 If you’re the person that is looking for an all-day adventure on the West Rim of the Grand Canyon then the Grand Canyon West 5-in-1 Ground tour is perfect. 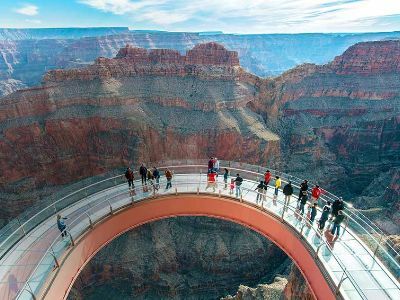 On this 10-hour Grand Canyon Skywalk tour you will have the opportunity to view the Hoover Dam, Guano Point, an ancient forest, the Hualapai Ranch and the awe-inspiring Eagle Point where Grand Canyon Skywalk is located. You can eat your picnic lunch while watching Native American ritual dancers perform. Or you may choose to walk along the transparent glass bridge at Skywalk (additional fee) that allows a person to view 4,000 feet below to the canyon’s floor. There is ample time to view the Native American village, shop for authentic handmade Indian jewelry. You might choose to just sit and talk in the Hualapai Market. There are also cowboy shows or you can learn to use a bow and arrow or tomahawk. There is also a free horse drawn wagon ride to the rim or enjoy a horseback ride to the rim for an additional charge. This Grand Canyon Skywalk tour has it all for the relaxed person that wants to spend quality time on the West Rim of the Grand Canyon, float down the Colorado River and fly in a helicopter. You might even choose to enjoy the wonders of the Grand Canyon Skywalk while on the West Rim. Your Grand Canyon Skywalk tour starts and ends with shuttle service from your hotel to the Las Vegas Airport. Once in the luxurious six person helicopter you will take a 45-minute flight to the West Rim of the Grand Canyon. You will observe spectacular scenery and interesting commentary from your tour guide on the Hoover Dam, Lake Mead, and the Grand Canyon. Upon your arrival at the West Rim of the Grand Canyon your helicopter will float effortlessly down 4,000 feet to the canyon’s floor. From there you will board a pontoon boat for a 15-minute cruise on the Colorado River. After your boat float you will ascend to the West Rim’s Welcome Center. You will have plenty of time in 2.5-hours to explore the West Rim by shuttle bus which includes visiting Guano Point where you will enjoy a Hualapai Indian buffet lunch, the Eagle Point Indian Village for history and culture and the Grand Canyon Skywalk can be added to your tour. Complete your remarkable Grand Canyon Skywalk tour with another 45-minute helicopter flight which includes a flyover of the famous Las Vegas Strip. If you are truly looking for an adventure with helicopters, boats, history, culture and the amazing Skywalk, then look no farther. 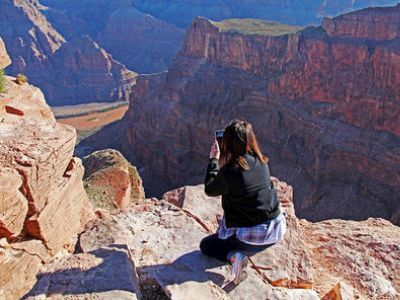 If you are looking for the open road, then the Grand Canyon and Hoover Dam Ground tour that highlights the beautiful natural scenery, history and culture of the area and you have the opportunity to enjoy the Grand Canyon Skywalk (upgrade option). After pickup at your hotel, your first stop will be a 15-minute photo opportunity at the magnificent Hoover Dam and then the adventure takes you through an ancient Joshua Tree forest while on your way to the West Rim of the Grand Canyon. Once at the West Rim you will have an ample 3-hour timeframe to explore the West Rim on your own. No guide to tell where to go or what to do. Use the complimentary Grand Canyon West Express shuttle buses for easy transportation between destinations. You can decide to visit the Eagle Point Indian Village, enjoy the Hualapai Ranch Wild West Show, view the Colorado River from Guano Point or you might decide to add the helicopter and boat option for more fun (additional fee). You can also take a walk on the Grand Canyon Skywalk (additional fee). This glass bridge allows for you to walk out some 4,000 feet above the canyon floor. You also receive lunch at one of three locations each with its own ambiance and western flare. Allow 3-hours of travel time each way from Las Vegas to the West Rim of the Grand Canyon. Your tour includes a knowledgeable and certified driver who is in tune with history, natural scenery and culture of the tour. Additional processing fees and fuel surcharges may exist depending on the options you select for your tour of the Hoover Dam and the Grand Canyon. So you always dreamed of flying over the Grand Canyon in your own private airplane landing at your own private airstrip. Moments later you have the options of either a helicopter and float trip (optional upgrade) or perhaps you opt for the exciting Grand Canyon Skywalk glass bridge (optional upgrade). Shuttle service from your hotel will start the adventure of flying to the Grand Canyon. Once aboard the executive style airplane you will have excellent views of the surrounding natural scenery as well as Lake Mead and the Hoover Dam. Your pilot will offer valuable tidbits about the history and culture of the area that is sacred to the Hualapai Indians. 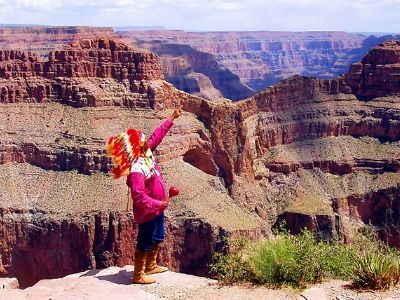 Once at the West Rim of the Grand Canyon you will experience the Hualapai culture in person. You can then view the Skywalk which is an incredible glass bridge that extends outward over the Grand Canyon’s floor some 4,000 feet in the air. To enhance your adventure venture out onto the Skywalk (additional fee) and take full advantage of the panoramic views. You will also enjoy a traditional Hualapai style lunch buffet at Guano Point as you gaze over the Colorado River. There is also a helicopter and boat float down the Colorado River upgrade available. Take an ECO-Star helicopter to the canyon floor and enjoy 20-minutes of up close and personal viewing of the canyon and the Colorado River. You might choose to float the river for 30-minutes as another upgrade option. Your return flight includes a flyover of the Las Vegas strip and a comfortable shuttle back to your hotel. The combo is the perfect fit of intimacy and luxury. Travel by a luxury Pink Jeep, soar in a helicopter to the bottom of the Grand Canyon and then take a float down the Colorado River. This is a very personalized trip because the Tour Trekker SUV can only accommodate 10 people. Start this 10-hour Grand Canyon Skywalk tour with hotel pickup and travel to Boulder City before driving over the Boulder Dam. You will pass through ancient Joshua Tree forests and view the Grand Wash Cliffs on your 2.5-hour drive to the West Rim of the Grand Canyon. At the rim you will be whisked away to the bottom of the Grand Canyon aboard a helicopter some 4,000 feet in elevation drop. Once on the canyon floor you will take a float down the Colorado River on a pontoon boat before returning to the rim by helicopter. You will then be given 3.5-hours to explore the West Rim of the Grand Canyon without a guide, so take advantage of the free West Rim shuttle service. You can visit interesting lookouts such as Guano Point, Eagle Point or visit the Hualapai Indian Village. Your Grand Canyon Skywalk tour includes a delicious lunch at one of these three locations. You may opt for an upgrade to walk along the famed Grand Canyon Skywalk (additional fee). Relax on your ride home in the comfortable Pink Jeep and free shuttle drop off at your hotel. 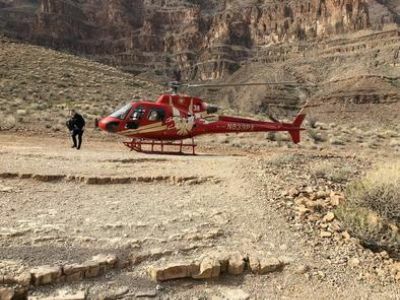 A truly one-of-a-kind adventure experience: You can take an airplane to the West Rim of the Grand Canyon and proceed to a helicopter for a stunning drop of 4,000 feet to the canyon floor, where you will cruise down the Colorado River. Your Las Vegas to Grand Canyon Skywalk tours starts with a shuttle pickup at your hotel which will take you to Boulder City where you will board you’re an airplane. During your 35-minute flight to the West Rim of the Grand Canyon you will witness marvelous views of Lake Mead and Hoover Dam. After landing at the West Rim you will be taken by helicopter and descend some 4,000 feet into the Grand Canyon. Witness up close the many layers of rocks and time as you proceed to float down the mighty Colorado River. Enjoy interesting insider information on the history and culture of the surrounding area by our licensed tour guides, as you ascend upward to the West Rim on a helicopter. From here you will explore Guano Point, Eagle Point and have a nice relaxing lunch. You might also choose to upgrade and include the Grand Canyon Skywalk tour (additional fee). Relax on your flight home and free shuttle drop off after a perfect adventure. Important note that a $15 per person fuel surcharge is not included in the tour price. Each person over 18 years must have a valid photo ID to fly according to FAA regulations. Children under 2 require proof of age. 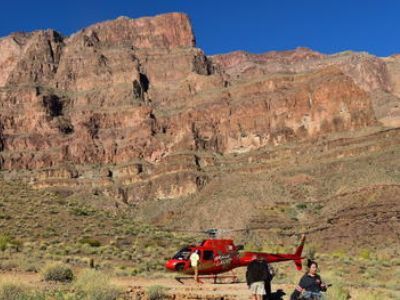 Fly by exclusive helicopter to the West Rim of the Grand Canyon for ample exploring opportunities. You can also upgrade and choose between a below the rim landing or a stroll on the famous transparent glass bridge known as Grand Canyon Skywalk. Your Grand Canyon Skywalk tour begins with shuttle pickup service and a 35-minute helicopter flight from Las Vegas to the West Rim of the Grand Canyon. You will view the majestic Hoover Dam, Lake Mead, Temple Rock and the Mojave Desert. This 7-hour includes a 3.5-hour layover on the West Rim. This gives you plenty of time to enjoy the other lookouts and viewing spots with the free West Rim shuttle service. Maybe you want to enjoy your lunch (included) at Guano Point or Eagle Point. You might even choose to eat at the Hualapai Indian Village. You are your own tour guide with lots of ground to cover. You can also upgrade your experience with an awesome helicopter ride 4,000 feet below the rim. View the Colorado River up close and marvel at its power. Take a different view point on the ascent and you have memories forever (additional fee). Another scintillating upgrade is the Grand Canyon Skywalk tour. 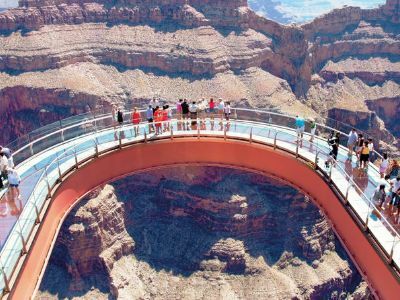 Walk 4,000 feet above the canyon floor on a glass bridge that overlooks the Colorado River (additional fee). Relax on your helicopter flight home that includes a flyover of the famous Las Vegas Strip and your free shuttle drop off. Hit the road in an air-conditioned coach where a helicopter and boat await to fulfill your dreams of adventure at the West Rim of Grand Canyon where the Colorado River and the Hualapai Ranch are waiting for you. You can even upgrade and take a stroll on the glass bridge at Grand Canyon Skywalk. This 12-hour Las Vegas to Grand Canyon Skywalk tours is a perfect trip for the beginner. You will travel 3.5-hours within a luxury air-conditioning coach to the West Rim of the Grand Canyon. Enjoy interesting commentary from the tour guides on the history and culture of the Mojave Desert. 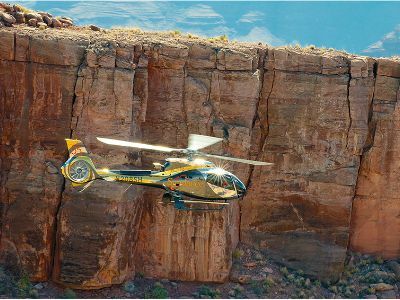 Once at the West Rim you will fly on a six-seat A-Star helicopter below the canyon rim 4,000 feet. You will have sufficient time for photos and gazing at the natural wonder as you float down the Colorado River on a pontoon boat. After your boat adventure you will be swooped up to the rim by helicopter. From here you will ride in a shuttle bus to Guano Point for a view of the Colorado River and then Eagle Point. You can learn more about Hualapai Indians at the village or experience the thrilling Grand Canyon Skywalk tour (optional upgrade). The next stop is lunch at a cowboy cookout on the Hualapai Ranch. After a scenic drive along the West Rim, the luxury coach will take you back to Las Vegas, where a shuttle drop off waits to take you to your hotel. The luxurious coaches are spacious and comfortable with climate control and video monitors as well as restrooms. The over-sized windows are perfect for viewing the majestic natural scenery. For the person seeking a small group this is your tour. Limited to only nine people your group will travel to the West Rim of the Grand Canyon through the natural scenery of the Mojave Desert. At the West Rim you will explore and adventure among the wonders of the Grand Canyon. Hike the West Rim or upgrade your adventure with a thrilling helicopter ride, a cruise down the Colorado River or visit and stroll the spectacular glass bridge at Grand Canyon Skywalk. Your 10-hour Grand Canyon Skywalk tour starts and ends with shuttle service to/from your hotel. You will enjoy a relaxing and informative ride through the Mojave Desert seeing such sites as an ancient Joshua Tree forest, Lake Mead and the Hoover Dam, where you will stop for a memorable photo. Learn the history and culture of the area from our expert tour guides as you pass through the Black Mountains and Grand Wash Cliffs on your way to West Rim of Grand Canyon. Once on the West Rim you will have 4-hours to explore on your own the Hualapai Indian culture and view the many outstanding overlooks like Guano Point and Eagle Point. You will have time to wander into the Hualapai Indian Village and enjoy a delicious complimentary Hualapai Indian buffet for lunch. You also have the option to upgrade your experience and include a 4,000 foot descent aboard a helicopter to the canyon below as well as a cruise down the Colorado River (additional fee). Or you might opt to upgrade to a Grand Canyon Skywalk tour. This horseshoe shaped structure allows for 360° panoramic views (additional fee).